Protect yourself and sign up for the FREE AVA Care Advantage Card! AVA will be there to support you if you are ever seriously injured in a car accident. AVA is here to ensure that you are aware of all of your rights and benefits. We are here to get you the best care and compensation. Case management is a collaborative process that facilitates recommended treatment plans to assure the appropriate medical care. Unfortunately, some accident victims find themselves not getting the care the need. AVA is here to make sure you get quality care. If you have been involved in an auto accident and are suffering from a serious or catastrophic injury, you need to understand you rights under Michigan’s No Fault Law and get the treatment needed for recovery. It is important for you to have experienced and professional case managers to guide you on your path to recovery and rehabilitation, and provide you with the information you need. In most cases, Michigan residents injured in an auto accident are entitled to 100% coverage of all of their medical bills. AVA has a single driving mission, to identify and assist those individuals who need help most. The AVA Team consists solely of medical professionals who have embraced the need to balance information, justice, access, and quality care with cost-efficient healthcare delivery strategies. AVA does not take sides. We hold as our two symbols, the Scales of Justice, and the Medical Emblem, to symbolize impartiality, fairness, justice, competent delivery, and equality of healthcare under the laws that govern accident victim healthcare in Michigan. Knowing your Michigan No-Fault Law rights is incredible important. It is not always easy to deal with auto insurance companies, medical care providers and daily life events after being injured in a care accident. AVA Care & Case Management is hear to help you find full recovery and to help make you whole again. If you have been involved in an auto accident and are suffering from a serious or catastrophic injury, you need to understand your rights under Michigan’s No Fault Law and get the treatment needed for recovery. It is important for you to have experienced and professional case managers to guide you on your path to recovery and rehabilitation, and provide you with the information you need. In most cases, Michigan residents injured in an auto accident are entitled to 100% coverage of all of their medical bills. Is an Attorney all that you need? Sometimes an attorney isn’t enough, especially when your accident injuries have caused you to alter your way of life. Are you unable to return to work and worried about falling behind on your bills? Do you have a head injury, broken bones or any medical condition caused by your accident? Do you need rehabilitation or alternative housing? AVA Care can help get you immediate care and support. AVA Care can help you deal with the insurance companies and work with your attorney if you need one. 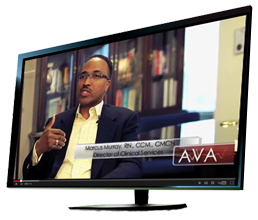 Get Better Faster with AVA Care. All you need to do is complete a claim form and AVA Care & Case Management, a Michigan auto case management company, will walk step by step with you, all the way to recovery. Highly skilled and experienced medical professionals will help guide you on this path to recovery. When necessary for care, recovery, or rehabilitation, all of your medical care, including case management, is covered entirely by your insurance company, which means no cost to you. The desire to regain full recovery and normalcy is a decision and recovery can look different for each person, but it is still accomplishment. At AVA Care & Case Management we believe our job is to inspire and motivate the injured person to achieve full recovery in the shortest amount of time possible. As we understand the heart-cry of a person who longs for the return of their privacy and independence. We are here to help you through the recovery process after an injury caused by an auto accident. Think about the joys of independence. Do you remember the days when you did what you want, when you wanted, without any limitation or obstacle? We believe the joy of personal freedom is worth the pain, commitment, and dedication to the hard work of rehabilitation. To that end, this area of our website is devoted to recognition and acknowledgement of the success stories of those who have overcome the odds, faced the challenges of recovery and who are now making a difference in the lives of all who hear their stories. May you be personally moved and motivated to pay the high price of endurance, as the light of recovery shines through your tunnel of rehabilitation. Remember as you work towards the light, at the end of the tunnel, the ocean-breeze of success awaits its moment to blow through your hair, as you walk the beaches of health and wholeness once again. FEELING LIKE YOUR BACK IS AGAINST THE WALL? Are you or is someone you know overwhelmed with the circumstances left behind by a automobile accident? Tell us how we can reach you or your loved one and an AVA Care Champion will contact you right away. Or you can phone a Case Manager at 586.461.2074. What is the Name of the hospital that the injured party has been taken to?